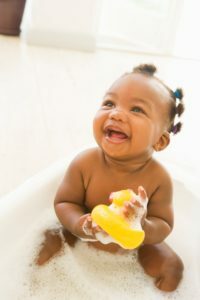 Bath time is a regular part of your child’s routine that sometimes may not be as enjoyable as you would like. But instead of rushing through it, take advantage of bath time by turning it into a fun, sensory activity! Waterfall station. Adding cups and small buckets to the tub can turn a regular bath into a water toy game. Make waterfalls in the tub; your toddler can practice their fine motor skills as they scoop up water and pour it into another bucket or back in the tub, making a waterfall. Use water bottles, a strainer, and spray bottles for extra fun! Bubbles, bubbles, bubbles! Add some bubbles to the bath for a special treat. Encourage your child to ‘draw’ a picture on the wall using just the bubbles. They will love creating fun pictures to show you and bubbles are easier to clean off a wall than crayon! You can also have your child try and pick up bubbles without popping them. This helps with learning how much force to use when picking up objects. But don’t stop them from popping the bubbles either; trying to pop them with their index finger will help form better hand-eye coordination. Who says bath and books don’t mix? If your little one gets antsy in the tub, try reading aloud to them during bath time. A favorite story can help calm down your child, you can even buy some plastic bath books that your child can take into the tub. Splash of something new. Keep bath time from becoming boring by adding a few drops of peppermint or lavender into the water for your toddler to smell. You can also play different music during bath time and sing songs or nursery rhymes to keep your child’s interest. Sponge fun. Sponges come in all shapes, sizes, and colors, and are perfect for bath time. Sometimes sponges come in animal shapes too! Let your toddler act out stories with the sponges and mix play into bath time. Squeezing water out of sponges is a fun way to strengthen your little one’s hands. Salon ready. Turn the bath into a salon. Wash their hair and ‘style’ it, just like the pros do. Try out funky styles, like a Mohawk! Be sure to have a handheld mirror so you little on can see their new ‘do’. 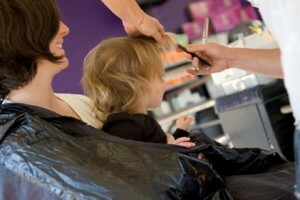 This can be great practice for when you take your child to a real hair stylist. Sometimes getting your child to take a bath can be difficult, but these ideas can make it more fun for them and you! If your little one loves bath time and can’t get enough water, be sure to check out our Benefits of Water Play blog. Studies have shown that moms and dads have different reading styles. Either way is good for communication skills. Haircuts can be a difficult experience for kids. Check out these tips to help make haircuts easier. Previous Previous post: What Chores Are Right For My Child?